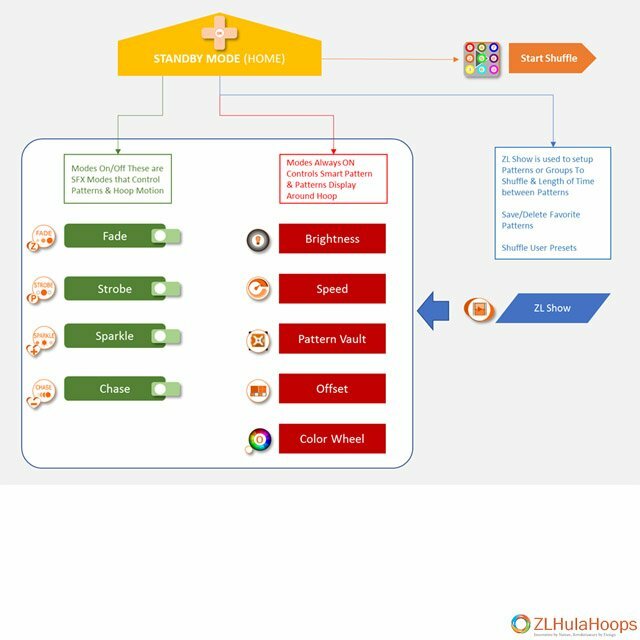 The ZL Hoop has a navigation menu that is primarily used for setting up different options and configuring the hoop when you desire to use different functionality. The LED Display provides feedback to the user during the setup process. !Note: You can’t enter into other modes when you are not in Standby. Always exit the chosen mode by pressing OK and this will return back to Standby Mode and save all your settings. 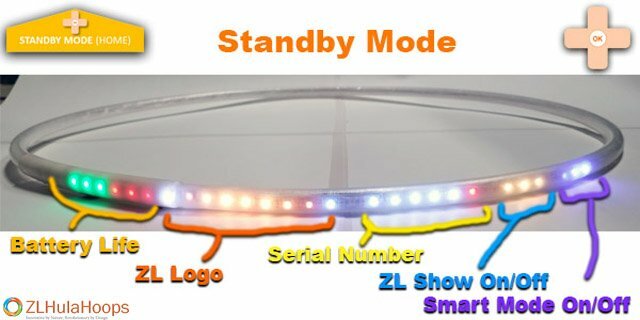 STANDBY MODE this is the Home display of the ZL Hoop, it shows your battery life, Serial Number, Shows what Shuffle Mode is active and for Gen 2 shows if Smart Mode is On/Off. You always need to be in this Mode to enter into any other Mode. GREEN MODES which are SFX added to patterns can be turned On/Off. Example turning on Strobe Mode will make every pattern Strobe in the selected color. RED MODES are always ON or Active as they are required for Each Pattern to Play. Example choosing a different group to shuffle on from the Pattern Vault.